* This paper is an extension of a proceeding of IROS2015. R. Kojima, O. Sugiyama, K. Hoshiba, K. Nakadai, R. Suzuki, and C. Taylor, “Bird Song Scene Analysis Using a Spatial-Cue-Based Probabilistic Model,” J. Robot. Mechatron., Vol.29, No.1, pp. 236-246, 2017. T. Otsuka, K. Ishiguro, H. Sawada, and H. G. Okuno, “Bayesian nonparametrics for microphone array processing,” T-ASLP, Vol.22, No.2, pp. 493-504, 2014. X. Anguera, S. Bozonnet, N. Evans, C. Fredouille, G. Friedland, and O. Vinyals, “Speaker diarization: A review of recent research,” IEEE Trans. on Audio, Speech, and Language Processing, Vol.20, No.2, pp. 356-370, 2012. J. M. Pardo, X. Anguera, and C. Wooters, “Speaker diarization for multiple distant microphone meetings: mixing acoustic features and inter-channel time differences,” Proc. of the Ninth Int. Conf. on Spoken Language Processing, pp. 2194-2197, 2006. C. K. Catchpole and P. J. Slater, “Bird song: biological themes and variations,” Cambridge University Press, 2003. F. Briggs, R. Raich, K. Eftaxias, Z. Lei, and Y. Huang, “The ninth annual MLSP competition: overview,” IEEE Int. workshop on machine learning for signal processing, pp. 22-25, Sept. 2013. H. Goëau, H. Glotin, W. P. Vellinga, R. Planqué, and A. Joly, “Life-CLEF Bird Identification Task 2016,” CLEF working notes 2016, 2016. K. N. R. Suzuki, S. Matsubayashi, and H. G. Okuno, “Localizing bird songs using an open source robot audition system with a microphone array,” Proc. of Interspeech 2016, pp. 2026-2030, 2016. K. Ryosuke, S. Osamu, S. Reij, N. Kazuhiro, and C. E. Taylor, “Semi-automatic bird song analysis by spatial-cue-based integration of sound source detection, localization, separation, and identification,” IEEE/RSJ Int. Conf. on Intelligent Robots and Systems, 2016. P. Aarabi, “The fusion of distributed microphone arrays for sound localization,” Eurasip J. on Applied Signal Processing, Vol.2003, No.4, pp. 338-347, 2003. J. M. Valin, F. Michaud, and J. Rouat, “Robust 3D localization and tracking of sound sources using beamforming and particle filtering,” 2006 IEEE Int. Conf. on Acoustics Speech and Signal Processing Proc., Vol.4, pp. IV-IV, 2006. C. V. Cotton and D. P. Ellis, “Spectral vs. spectro-temporal features for acoustic event detection,” WASPAA-2011, pp. 69-72, 2011. Y. Ohishi, D. Mochihashi, T. Matsui, M. Nakano, H. Kameoka, T. Izumitani, and K. Kashino, “Bayesian semi-supervised audio event transcription based on Markov indian buffet process,” ICASSP-2013, pp. 3163-3167, 2013. M. L. Chin and J. J. Burred, “Audio event detection based on layered symbolic sequence representations,” 2012 IEEE Int. Conf. on Acoustics, Speech and Signal Processing (ICASSP), pp. 1953-1956, 2012. D. Rybach, R. Schlüter, and H. Ney, “Silence is golden: Modeling non-speech events in WFST-based dynamic network decoders,” ICASSP-2012, pp. 4205-4208, 2012. Y. Sasaki, M. Kaneyoshi, S. Kagami, H. Mizoguchi, and T. Enomoto, “Daily sound recognition using pitch-cluster-maps for mobile robot audition,” IROS-2009, pp. 2724-2729, 2009. C. Baugé, M. Lagrange, J. Andén, and S. Mallat, “Representing environmental sounds using the separable scattering transform,” ICASSP-2013, pp. 8667-8671, 2013. V. Ramasubramanian, R. Karthik, S. Thiyagarajan, and S. Cherla, “Continuous audio analytics by HMM and viterbi decoding,” ICASSP-2011, pp. 2396-2399, 2011. 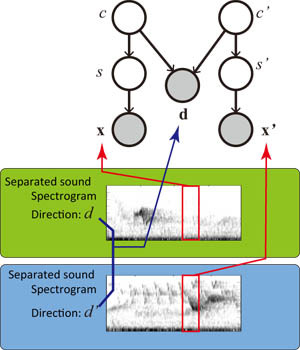 K. Nakamura and K. Nakadai, “Robot audition based acoustic event identification using a Bayesian model considering spectral and temporal uncertainties,” 2015 IEEE/RSJ Int. Conf. on Intelligent Robots and Systems (IROS), pp. 4840-4845, 2015. P. W. Holland, K. B. Laskey, and S. Leinhardt, “Stochastic block-models: First steps,” Social networks, Vol.5, No.2, pp. 109-137, 1983. K. Nigam, A. K. McCallum, S. Thrun, and T. Mitchell, “Text classification from labeled and unlabeled documents using EM,” Machine learning, Vol.39, No.2-3, pp. 103-134, 2000. S. Uemura, O. Sugiyama, R. Kojima, and K. Nakadai, “Outdoor Acoustic Event Identification using Sound Source Separation and Deep Learning with a Quadrotor-Embedded Microphone Array,” ICAM2015, pp. 329-330, 2015. H. Nakajima, K. Nakadai, Y. Hasegawa, and H. Tsujino, “Correlation matrix estimation by an optimally controlled recursive average method and its application to blind source separation,” Acoustical Science and Technology, Vol.31, No.3, pp. 205-212, 2010. S. Sra, “A short note on parameter approximation for von Mises-Fisher distributions: and a fast implementation of Is(x),” Computational Statistics, Vol.27, No.1, pp. 177-190, 2012. K. Nakadai, H. G. Okuno, H. Nakajima, Y. Hasegawa, and H. Tsujino, “An open source software system for robot audition HARK and its evaluation,” Humanoid Robots, 2008. Humanoids 2008. 8th IEEE-RAS Int. Conf. on, pp. 561-566, 2008. G. Schwarz et al., “Estimating the dimension of a model,” The annals of statistics, Vol.6, No.2, pp. 461-464, 1978.